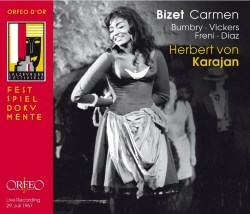 This is a re-issue on three CDs from Orfeo of the production of Carmen under Karajan given at the Salzburg Festival in July 1967. Since the rubric at the front of the booklet reads ’29 Juli’, one assumes that the recording was the result of a single evening’s performance. On paper the cast is a strong one. Bumbry has all the technique and presence. Vickers was approaching the height of his expressive powers. Freni was always adaptable and convincing in such rôles. Diaz knew what he was about. Somehow, though, Karajan’s intention to bring a production to the stage (of the Großes Festspielhaus, built to his specifications and opened barely half a dozen years earlier) which at all costs must bear his stamp and reflect his priorities stifled the singers and cramped even the expansiveness off the Vienna Philharmonic Orchestra. There is next to no punch or ‘swing’ - certainly no sense of forward momentum or plausible climax. The lack of energy in the celebrated farandole from L’Arlésienne [CD 2, tr.4] is an example of something rather dull. Secondly, the upper reaches of Bumbry’s Carmen had a sterility and ‘blankness’. Vickers’ delivery at times bordered on the eccentric. While the tempi demanded by Karajan were - also quite controversially at the time - distressingly slow. Carmen demands fire, spontaneity, rashness from its characters, a self-awareness (ultimately, of where their actions will lead) which is suppressed yet dogs them. And actively haunts us. Karajan is more intent on creating a ‘contained’ experience. He seems to suppress expression at times: how mundane is the “Où me conduirez-vous?” [CD 1, tr.15], as if Carmen didn’t know, and didn’t want to twist her way into another conquest. In the next scene Vickers calls Carmen’s name rather more like a father or teacher than a prowling would-be lover. Diaz really lacks any kind of inspiration or tension. The ‘heat’ in Bizet’s conception can be insisted on too much. But Carmen is hardly a demonstration tape on seduction! This reigning in of the singers seems to have induced players in several of the ensemble scenes to drop their guard; to prize respect and delicacy over emotion. The thrill has been emptied from the work. All urgency and expectation have been removed… listen to the pedantic entr’acte before the Second Act [CD 2, tr.1] with a noisy dance - apparently introduced by Karajan - which actually slows things down. To thirst for the sultry and sinuousness in Bizet’s amazing score when it’s not there is to be disappointed. To know that it’s been stripped by Karajan - in order to further assert his sense of control, and in the interests of projecting his lop-sided concept of musical theatre, it seems - is painful. The Spars Code (DDD) is marked clearly to suggest that digital tapes were used for the recording despite the fact that digital tape recorders only really became widely available a decade or so after this performance. The acoustic is, however, neither boxy nor over-restricted. While it’s hardly surround stereo, it does convey some of the claustrophobic world in which the bulk of the action takes place - including the obsessive hearts and minds of the principals. The booklet has brief background and the four acts’ synopses in German and English with a track listing in French. There is no useful context on the status and reception of the recording. It’s important to distinguish this audio recording from the more acceptable film of the same production made available on DVD (Deutsche Grammophon 0734032) and reviewed favourably by Christopher Howell. This release, then, really cannot be recommended in all but a few respects. It certainly lacks ‘electricity’; there is no tragedy; the performance really by-passes anything personal in the way the singers relate to one another; it almost eschews emotion in any form. If you want to recapture the night in 1967 in Salzburg or collect all performances by (one or more of) the principles (perhaps Freni, most justifiably), then you’ll want this set. Otherwise the classical recordings by Callas (as part of EMI Classics 95918) or de los Angeles (Warner Classics 539011) are far more satisfying.